So the transfer window shut and although Albion ended up with a net spend of more than £39.95million, Friday morning arrived with a number of Brighton fans shrouded in doom and gloom. No incoming striker equals almost certain relegation? Well, not in my Seagulls world. Yes, after any transfer window shuts there is always a degree of what might have been, with focus sometimes on ‘the ones that got away’. But on reflection even the most pessimistic Albion fans must still see that the Premier League glass is half full rather than half empty? Would fans really want Chris Hughton spending for spending’s sake? The history of Albion in the era of the transfer window is littered with panic buys and players who clearly were not what it said on the tin. As a supporter, you always want more, but if the squad was perfect we’d be up the top of the league looking forward to Champions League football in 12 months’ time. What we have now, I believe, is enough to keep us competitive and take us to the next transfer window at Christmas. Then at the halfway point of the season both Hughton and Tony Bloom will know what is required to keep the Albion in the all important top four of the bottom seven. One of the various aspects of the window was the failed medicals of Neto and Raphael Dwamena prior to big money moves to the Amex. Disappointing, yes, but ultimately a good thing. These days everything is meticulous in the examinations and rightly so given the potential amounts of money being spent. 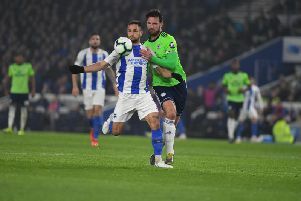 The disappointment extended to failing to complete a last-minute deal for Romanian striker Florin Andone and then Vincent Janssen turning down a move from Spurs. With the Albion getting a two hour extension to 1am on the deadline, it looked hopeful at one point, but in the end came to nothing. Perhaps in the cold light of day, it might end up being the best for the Albion? Clearly we are not party to the details of the personal terms, but looking at the players the Albion have attracted it’s apparent that they are competitive when it comes to the issue of the weekly wage. Janssen’s decision not to join is puzzling as he’s now fourth choice striker at Spurs. With his international ambitions, you would have thought he would have jumped at the chance to effectively be first choice at the Amex? Money before sport? Again disappointing, but ultimately every Spurs fan I’ve spoken to since he turned the Albion down thinks we may have dodged a bullet. That aside, after the international break it’s back to Premier League action this Saturday with the clash of the Albions. If things had been different, Tony Pulis might well have been in the home dugout at the Amex, having been linked with the Brighton job after the sacking of Gus Poyet. He’s certainly a proven manager at this level and will provide the Seagulls with a stiff test. But it’s a test that ultimately they can measure up to. Despite all the doom and gloom merchants, I think this is a game that the Seagulls can get something out of, possibly that all important Premier League win.